Enjoy authentic tasting Italian food at La Porchetta. We provide good quality food at affordable prices, a formula which has seen us grow to over 80 locations Australia wide. All of our restaurants use only the finest quality ingredients to make our famous pizza and pasta as well as our range of meat, poultry and seafood dishes. You can now take the La Porchetta experience home with you with our Pronto take away service. We have something to suit everyone's taste and budget. Been going to La Porchetta for many years and never disappointed in fact , I really rate this place ! Whilst not extravagant we have always found the food excellent value and service extremely efficient ! We place large orders and have never had an order Missed which is much more than I can say for many other places I have patronised ! The pollo avocado with tortellini is the bomb . The Original Porchetta pizza trumps anything I’ve had in Lygon st . Parmas and steaks are generous and delicious ! The Ballarat franchise outshines others food and service wise . My only criticism is the external paintwork could do with a refresh ! To summarise we bloody love this place and it upsets me to read the negative reviews! We arrived in the rush hour, yet we found the service was excellent. We ordered a Fettuccine Carbonara and a Pizza with the lot. Two wonderful dinners with out a lot of delay. As we were driving travellers, asked for Non Alcoholic beer, but from there alcohol display no non alcohol beer. Good call, the pizza was worth writing about fabulous. There is a step out the front to access the shop so the access is troublesome. I'm told the food is good and filling. 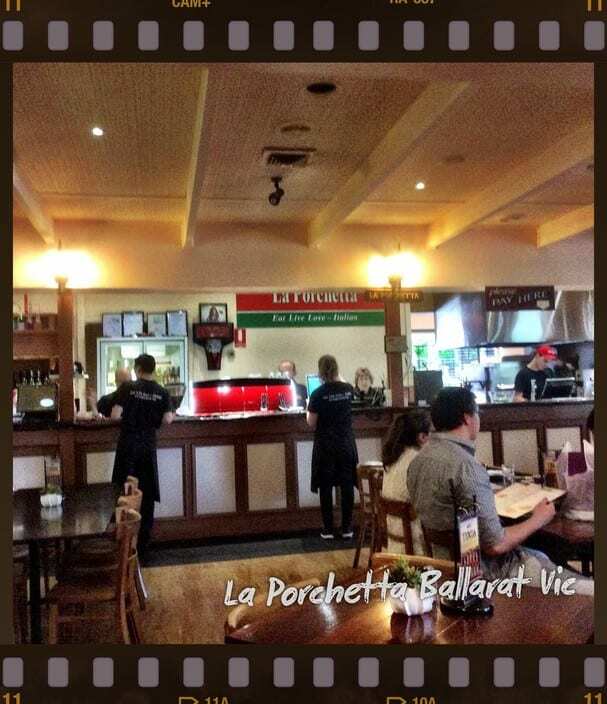 Have visited La Porchetta, Ballarat, many times and have always been quite satisfied with the experience, food and service-wise, basic though it is. However, my daughter and I who are vegetarians (she very strict) were eating the vegetarian Alfredo recently and we both discovered shreds of MEAT in our meals! I mentioned this to our service person on the way out who was very apologetic and said they would speak to the chef about it. I should have spoken to management but didn't like to make a fuss, but it's REALLY turned me off. I wonder how safe the meals are for those with allergies etc. Very disappointing. Have been to this La Porchetta a few times and it's generally when there are no other options available. As far as La Porchetta 'Restaurants' go, the Ballarat one is the better of a bad bunch.